NEPCA area chairs help the organization assemble its annual conference by helping the program chair determine the worthiness of paper submissions. They also help submitters fashion their proposals. NOTE: All the emails links should be live. See below for the full listing of responsibilities. This is a current list of specialized chairs, but NEPCA is open to new panels and individual papers on a much wider range of subjects. If you don’t see your area, don’t despair. Contact the None of the Above chair at the bottom of the list for consultation and assistance. None of the Above: Lance Eaton, northeastpopculture@gmail.com. 1. Solicit proposals in your area for the upcoming NEPCA conference. Get details on the upcoming conference. 2. Advertise regularly for proposals. A good place to do this is on H-Net. We strongly recommend you post monthly Calls for Papers on H-Net. You can send notes to H-Commons. It currently uses a system called H-Announce for Calls for Papers. We also encourage you to send out flyers to outlets you may know of just as department heads, blogs, other professional organizations, and social media. 3. Occasionally go into the shared folder of submitted CFPs to evaluate them for worthiness and recommend to the Program Chair whether or not a proposal should be included in the conference. Please note: The program committee makes the final call on accepting or rejecting proposals. We almost always accept the area chair recommendation, but sometimes have to reject papers that don’t fit into a conference panel slot. Please advise applicants that they will hear from the Program Chair by early July. Please send electronic versions of your proposal to: [Use the URL for the current year’s Google form]. Is it okay to submit to more than one chair if the topic crosses topics. Please, send proposals for panels or abstract to me at the address given, fsalamone@iona.edu. 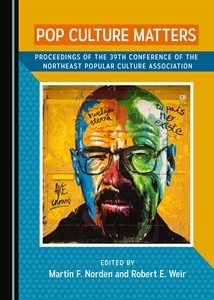 Papers of any topic dealing with popular culture in a global aspect are welcome. I interpret the term quite broadly – music, dance, literature, art and philosophy, for example. Abstracts should give your contact details and affiliation. 50 to 100 words of description should suffice. Student abstracts are welcome. Should submissions on crime/mystery fiction just go to None of the Above? Depending on the focus, I’d say either American Literature (if a US author), World Literature (non-US writer), or Storytelling is you focus is on narrative development/structure. Can you submit more than one topic for consideration if they are in different areas? Sorry Allison–you have to choose. We try to get as many different people on the schedule as possible, so just one submission per person.